Nepal is a small, landlocked country situated between India and China. Famous for the world's highest mountain, Mount Everest, and the birthplace of Lord Buddha. Nepal offers amazing and diverse holiday opportunities. With its ancient culture and the Himalayas as a backdrop, it is known as the roof of the world. Read more about Nepal country facts, visit Nepali local media sites or flick through the photo galleries. If you plan to travel by land, take a train or a bus to the nearest border town, and research local bus schedules to find a bus to the border. Once there, it is likely that you will need to walk across the border and catch a taxi or bus on the other side. There are several land crossings at the India-Nepal border. If you are coming from Calcutta, consider crossing at Naxalbari or Birganj. From Darjeeling, try Siliguri and from Varanasi or Delhi, take Sunauli. Try a tour. For a more organized experience, head to a travel agent or tour operator in India to book travel. The bus/train trip from India to Nepal can be long and grueling, and a tour operator will ensure that you are able to make the transportation changes on schedule. If there are no available tours from your location, ask the travel agent for schedules and price information to better assist you in planning. Book a plane ticket. The easiest and most convenient way to get to Nepal from India is to fly. That way, you can avoid the long bus or train ride, and you will be spared the hassles at the border. Cities in India with direct flights to Nepal include Delhi, Calcutta and Bombay. All international flights to Nepal arrive in Kathmandu. Be sure to arrive in Nepal with enough money to cover the tourist visa, which costs around $30, and either two passport-sized photos or the money to pay the photographer in the arrivals area. There is no ATM before immigration. Climate factors are very important in deciding on a visit to Nepal. October-November, the start of the dry season, is in many ways the best time of the year in Nepal. With the monsoon only recently finished the country-side is green and lush and Nepal is at its most beautiful. Rice is harvested and there are some more important and colourful festivals to enjoy. At this time of the year the air is sparkling clean, visibility is unexcelled and the Himalayan views are as near perfect as you can ask. Furthermore the weather is still balmy, neither too hot nor too cold. For obvious reasons, this is also the peak tourist season. In December - January the temperatures and visibility are still good, though it can get very cold. Trekkers need to be well prepared, as snow can be encountered on high-altitude treks. Heading for the Everest Base Camp at this time of the year can be a real feat of endurance and the Annapurna Circuit trek is often closed by snow on the Thorang La pass. Down in Kathmandu the cheaper hotels, where heating is non-existent, are often chilly and gloomy in the evenings. There's sometimes a brief winter monsoon, lasting just a day or two in January. February-March - April, the tail end of the dry season, is good second-best time. The weather gets warmer so high-altitude treks are no longer as arduous, although by the end of the dry season, before the monsoon breaks, it starts to get too hot for comfort. Visibility is not good as earlier in the dry season since the country is now very dry, and dust in the air reduces that crystal Himalayan clarity. In compensation, Nepal's wonderful rhododendrons and many other flowers are in bloom so there are plenty of colours to be seen along the trekking trails. May and the early part of June are not the best months as it is extremely hot and dusty and the coming monsoon hangs Over you like a threat. Mid-June to September, when the monsoon finally arrives, is the least popular time to visit Nepal. The rains wash the dust out the air, but the clouds obscure the mountains so you're unlikely to enjoy more than a rare glimpse of Himalaya. Although it doesn't rain all day it usually does rain everyday and the trails will be muddy and plagued by leeches. Despite this, it is possible to trek during the monsoon, although high rivers may further complicate matters and it's certainly not as pleasant as other times of the year. Landslides sometimes block roads during the monsoon but many visitors still come to Nepal from India as the weather is even less pleasant down on the plains. The latter parts of the monsoon, the months of August-September, are a time of festivals which will certainly enliven a visit to Kathmandu. All visitors except the Indian nationals must hold a passport and a valid visa. The visas can be obtained at the Nepalese Diplomatic Missions and Consulates abroad and entry points issue visa for visitors. The visa will be extended at the Department of Immigration. 1. The single entry tourist visa can be obtained from the entry points of Nepal or from the Royal diplomatic missions abroad by paying US$30 for 60 days. 2. If the visitor, who has already visited Nepal under tourist visa, intends to come again within15 days of the same visa year he/she can obtain entry visa by paying US$50 for 30 days at the entry points or at the Royal Nepalese diplomatic missions abroad. 3. The visitors who wish to stay for more that 60 days in Nepal can extend their tourist visa by paying the equivalent of US$50 in the Nepalese currency for 30 days from the Department of Immigration. 4. Business visa with multiple entry facility for the period of one year and five years can be obtained from the Department of Immigration on the recommendation of Ministry of Industry by paying the equivalent of US$250 and US$100 respectively in the Nepalese currency for the foreign investors. Royal Nepal Airlines the national flag carrier of Nepal and other International airlines operate scheduled flights to Kathmandu from Abu Dhabi, Bangkok, Bombay, Calcutta, Doha, Delhi, Dubai, Dhaka, Paro (Bhutan),Varanasi, Frankfurt, Paris, Hong Kong, Karachi, London, Moscow, Singapore, Osaka, Lhasa and Vienna. The International Airlines operating their flights to Kathmandu include Aeroflot, Biman Bangladesh Airlines, China South West Airlines, Druk Air, Gulf Air, Indian Airlines, Lufthansa, Qatar Airways, Singapore Airlines and Thai International. The overland tourists entering the kingdom with their vehicles must possess an international carnet. Nepal has every type of accommodation facilities that a tourist might ask for. This ranges from the international standard star hotels to budget hotels and lodges. Similarly one can also have a choice of sightseeing from a range of different tour packages. In order to have an assured quality service it is advisable to use the facilities and services of government-registered hotels, lodges, travel agencies the licensed tour guides only and engage an authorized travel/trekking agency. Of Kathmandu) one can have a distant view of Mt. Everest and beautiful Himalayan range. Trekking is the best way to get to interesting and remote mountain villages of Nepal and to enjoy views of the focused peaks together with their lifestyle untouched by modern civilization. The river rafting which is known as White Water Adventure represents another major attractions. With distance of 100 miles, one can see the topographical variations with the river rising from the higher points near Nepal - Tibetan border and then dropping dramatically to lower levels the plains bordering India. For those who wish to view wildlife, Nepal offers plenty of scope. 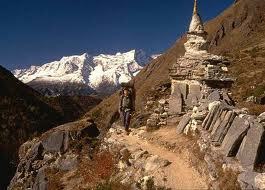 There are eight National Parks and four Wildlife Reserves and two Conservation Area in Nepal. For the less adventure, Pokhara the lake-city of Nepal has no equal as it provides ample opportunities for fishing, swimming, canoeing and boating along with the sightseeing of majestic panoramic views in its background. It is only Pokhara, a tropical spotty with an altitude of about 900 meter from where one can see the mountain crossing over 8000 meters from such a short distance of about 40 kilometers. Gods and goddesses, visit temple, observe fasting and undertake feasting. The most important aspect of Nepalese culture is the religious harmony and understanding prevailing among the Hindus and Buddhist. a lofty conical spire capped by a pinnacle of gilt copper. Painted on the four sided base below the spire are the all seeing eyes of Lord Buddha. The whole area around the Stupa contains an array of small stupas and temples. This is one of the best places from which to view the Kathmandu valley, as it is situated on a small hillock. Also known as BHADGAON meaning the city of devotes, this place is the home of medieval art and architecture. Lying 14Km east of Kathmandu city. This place was founded in the 9th century and is shaped like a conch shell. The city is at the height of 4600 ft. above sea level. In Bhaktapur you will visit the Durbar Square with its array of temples overlooked by the palace of 55 Windows built by King Bupatindra Malla, the Nytapola Temple. This temple, which was also built by king Bhupatindra Malla, is the best example of the Pagoda style and stands on five terraces, on each of which stands a pair of figures, famous strong men, elephants, lions, griffins and goddesses. Time permitting, a visit to the museum of Thanka painting can also be considered. A 30 minute walk brings you to the Dattatraya temple and Pujari Math which can also be done provided there is plenty of time at the clients' disposal. It is situated about 35Km. east of Kathmandu city and from here one can see Mt. Everet and other peaks of the Himalayas. Nagarkot is located between Kathmandu valley in the west and Indravati in the east. He top of Nagarkot commands accelerating views in all direction. The altitude of Nagarkot is 2229Mt. above from sea level. It is also very popular for the viewing sunrise and sunset. It is situated at an altitude of 1600 m. above from sea level, and 32 Km. from Kathmandu City. Dhulikhel is famous for its vantage location in viewing the Himalayan ranges, from Cho Oyo in the east to Himalchuli in the west. It is popular for viewing the sunrise and sunset. 5 Km. away from Kathmandu city. Patan, also known as Lalitpur, is a city of fine arts, enclosed within 4 stupas, which are said to have been built in the 3rd century A.D. by Emperor Ashoka. You will see Durbar square, the Patan durbar (palace), which houses a bronze collection, the Krishna temple built by King Siddi Narsinh Malla, Hiranya Varna Mahavihar, and Mahaboudha Temple. A trip to the Tibetan Refugee Centre and the Handicraft Centre will be included during your visit to Patan, where you will witness the hand weaving of Tibetan carpets and molding of metal statues. Pokhara is Nepal's second most popular tourist destination and its adventure capital. 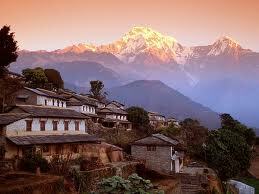 It is overshadowed by a massive wall of the Himalayas, and dominated by the towering peak of the Annapurna range. Even more impressive is the fishtailed pinnacle of Mt. Machhapuchhare (6977mt.) For the adventurous, the massif of Mt. Dhaulagiri (8167m) waits to be explored. Pokhara is the starting point for the most famous treks in Nepal, in the Annapurna area. Pokara is situated 200 K.M. west of Kathmandu.